I was lucky enough to sit one afternoon with a friend of mine by a small circular pool, about 15 m in diameter, in a park in Ramat-Gan (a city neighboring Tel Aviv). Then a hooded crow (Corvus corone cornix) came by, landed on a lamp in the center of the pool, just above the water, with a piece of bread in its bill. It put the bread under its leg, and started to shred it to pieces, putting the crumbs in the water, then retrieving the wet crumbs and eating them. I thought that was pretty neat, and showed it to my non-biologist friend. The crow finished eating the bread and left the pool. However, based on the crow's focus of attention, I suspected there was more in that behavior than met the eye. Luckily, my friend and I were engaged in a long conversation. About an hour and a half later, the same or another crow arrived, also with a piece of bread in its bill, to the very same lamp, doing the same thing. However, this time, while doing this, it suddenly stuck its head in the water and grabbed a fish. A small cichlid. It then took off with the fish in its bill and landed on the grass to eat it. 1. To view an unsuccessful attempt, press here. 2. To view a successful bait-fishing, press here. I am sorry to say that as much as I wanted to, I did not have the time to thoroughly study this behavior. I had no research position to pay for my time. However, this was something special. Crows and ravens are known to be very clever, but this was beyond what I knew is known about them. The minimum I could do, therefore, was to visit this place a few more times, document the phenomenon, and try to make an estimate of the extent this behavior was spread among the dense crows community living in that park. So here are my brief conclusions. In addition to this particular pool, there is a large artificial pond in the park, in which there are many fish. Fishermen regularly arrive to this pond to fish. Little egrets, night herons, pied kingfishers, kingfishers, and white-throated kingfishers are among the common fish-eating birds that hunt fish in it, and there are a number of places that could be used by crows as a perch to catch fish. So there was a chance that this behavior was practiced by many crows, depending, perhaps, on how long ago was it first learnt. To test this, I spread slices of bread all over the park to see how crows handle them. The result was that crows do what crows do, namely, they ate all pieces of bread on the spot. It was only near that particular small pool that I have seen this phenomenon again. As this was at the beginning of the crows breeding season, and as there were two nests that were built at the time on two adjacent sycamore trees next to the pool, I suspected, by following these unmarked crows, that there was only a single crow, possibly two (one of each nest), which are using the bait-fishing technique. One way or another, it was a rare phenomenon. Altogether, my own bait, slices of bread spread around the pool, worked well. I have seen about 10 crows’ attempts to use bread bait to lure fish, all on the very same perch, and 4 of them were successful. I managed to document two of them, one with my 200 mm camera (photos on the top-left corner), the other with a very good digital video camera recorder that I rented for this purpose. Given my equipment, and given that the crow was not tame enough to fish when I was at the edge of the pool, the only way I could do this was by leaving my camcorder continuously recording on a tripod, while watching the pool from a distance. The two wmv files that I put here, are the result of this low-tech effort. One shows an unsuccessful attempt, the other a successful one, pretty much like the first time I saw the crows doing it. Observations were made during March, 2000, except for the time I videotaped it, which was on April 5th, 2000. Crows of Caledonia are known to prepare sticks and adjust their size, or bend metal hooks for hunting larvae in wood. Ravens are known to pool fishermen’s bait out of the water, and steal their fish. Crows all over the world are known to lift up pecan nuts and drop them on the road to crack and eat them. They are also known for using this technique to break clams on rocks. 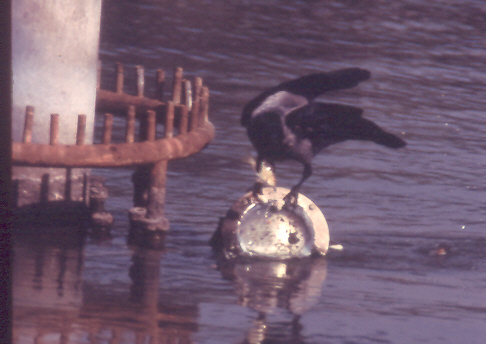 However, giving up bread in order to gain fish is unique, mostly because the crow gives up some resource it owns (food), not just expending energy. Admittedly, it retrieves most of the bread and eats it before it gets lost. Admittedly, it may not understand the fish will eat the bread. But clearly, it did not need to soften the fresh bread that I put their just a while ago, and it lost some of it in the water. In the end, when it catch the fish, it does not hesitate leaving the bread behind, to fall in the water. Did it expect to eventually lose its bread when it brought it to the pool (rather than just expected to gain a fish)? – This is really difficult to tell. However, as much as can be seen, this was a deliberate behavior, and very special. Regarding whether it qualifies for the definition of tool-using, maybe it does. It took a slice of bread, held it in its foot, and put only pieces of it in the water. As shown in the video, it seems as though it even deliberately adjusts size and rate of the crumbs it dropped in the water, according to the presence or absence of fish in the water next to its perch. However, more data should have been gathered to determine that. There are other birds known to use bait to lure fish, the most famous among which is the green-backed heron, which drops insects in the water. In those birds the trait is known to be heritable, being improved later by experience. In the hooded crow it is much more likely to be a self learnt behavior by one individual, maybe copied by another, than a rare lucky mutation. As far as I know, the bait-fishing behavior is now extinct among the park’s crows population. The small pool has been empty for several years, and when there was water in it, its level was sometimes too low to reach from the perch, or had no fish in it. Hence, my documentation is probably the only one available for such an amazing behavior of wild crows. Higuchi, H. 1986. Bait-fishing by the Green-backed Heron Ardeola striata in Japan. Ibis 128:285-290. -. 1988a. Bait-fishing by Green-backed Herons in South Florida. Florida Field Nat. striata associated with territory quality. Ibis 130:39-44. Zach, Reto. 1978. Selection and Dropping of Whelks by Northwestern Crows." Behavior 67: 134‑47. Zach, Reto 1979. Shell Dropping: Decision-Making and Optimal Foraging in Northwestern Crows. Behavior 68: 106‑17. My current job as a couple therapist (in Hebrew). New Theory for Why We Cry: About my paper on the evolution of emotional tears.